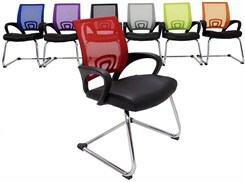 Mesh Guest Chairs in 6 Bright Colors In Stock + Free Shipping! Slim profile, comfortable design and an unbelievable price make this an excellent choice for the busy reception area or any guest seating requirements. Choose a color to complement your d�cor, or, mix it up with a blend of colors for a fun and colorful reception area. Brings a splash of color and excitement to any room. Value office seating with a designer appearance. 1-1/8" diameter steel tube framework with chrome finish. 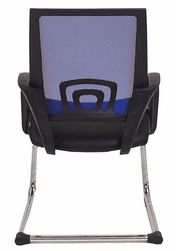 This chair is tested for users with a maximum weight of 220 lbs. but is recommended for the small to mid sized user for lengthier applications. 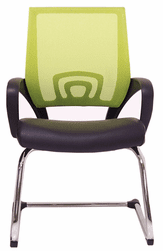 Leather upholstered seat over foam cushioning provides easy clean up and excellent wear in busy guest/reception areas where spills and soil are expected. 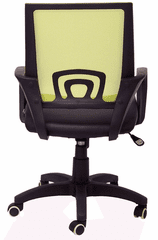 Mesh back design not only looks good but breathes and has a flexible resin back support for the lower back area. Polypropylene armrests are sturdy yet comfortable on the forearms. Anti-tip front feet for safety. Measures 22-1/2"W x 22"D x 36"H overall. Seat is 18-3/4"W x 20"D. Seat height 18" high. Back is 18"W x 20"H. Ships unassembled. Shipping weight 28 lbs. Meets CA fire foam approval. 5-Year Limited Warranty. PRICE INCLUDES SHIPPING! IN STOCK!